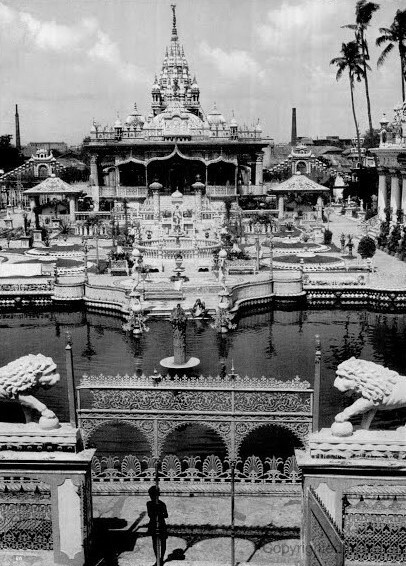 India itself, the legendary treasure house, the ancient heart of the world, the tiara of the British Empire, was last week in peril. Japs were in Burma, headed west. And what was to become of 300,000,000 Indians was no longer entirely in the hands of the India Office in London. The destiny of India had been thrown out once more as a stake of war. That was nothing new. Five thousand years ago there were great civilized empires in India. Conquerors roared in through the Northwest Frontier, Aryans, Scythians and Macedonians under Alexander the Great. First and last there were six great Moslem invasions. The result is that India has 80,000,000 Moslems and 250,000,000 Hindus. But most of the fight is in the 80,000,000, while most of the talk is in the Hindus, whose leaders are the ones who demand independence for India. Independence, under one name or another, may well be the belated price Britain has to pay Gandhi, Nehru & Co. to get their India really to fight. The British, India's last invaders 200 years ago, have not been cruel to that country which is as big as European Russia. They have saved it from war and famine and raised its substinence level well above that of China. But LIFE's Photographer Wallace Kirkland saw not one steel plowshare, scythe, harvester, reaper or tractor in a land where 90% of the people are farmers. British paternalism has filled India with far more rage than gratitude, since Queen Victoria became Empress of India in 1877. But the true treasure of India is not in its glittering array of temples and mosques and palaces. It is not even India's second-rate mineral deposits or third-rate industrial plant. What the onrushing Japs want from India is a treasure surpassing all these. They are ravenous for India's labor supply of 300,000,000 people, 20% of the working hands in all the world. And this vast labor reservoir is overwhelmingly docile, intelligent, skilled, used to obedience and small pay. The ruler for whom it works and from whom it buys has always heretofore been the most powerful ruler in the world. RULERS OF BRITISH INDIA, gathered around Viceroy Lord Linlithgow (front center), are (first row): Bhopal's Nawab, Gwalior's Maharaja, Bikaner's Maharajadhiraja, Nawanger's Maharaja who is Chancellor of the Chamber of Princes, Viceroy, Bahawalpur's Prime Minister, Madra's ex-Officiating Governor, Dharbhanga's Maharajadhiraj, Punjab assemblywoman and reformer; (second row), Chhztzri's Nawah, Cooch Behar's Maharaja, Rampur's Nawah, Patiala's Maharaja, Jodhpur's Maharaja, Bombat Parsi, Khallikote's Raja, Punjab assemblyman, leader of the Madras opposition, and Berar delegate to Chamber of Princes. Last row includes (center) two of Viceroy's secretaries. These 30 mean and one woman constitute India's National Defense Council. They rule British India's 280,000,000 people, plus some of the 562 Indian states of the semi-independent princes who have backed Britain to the limit. BRITISH PERMIT the Moslem Pathans of the Northwest Frontier to make their own crude rifles. Lower pipe is barrel, being ground to size by steel abrasive insert. IN THE SQUALOR of the south, poor Indians fluff up moonj fiber (left), card it (Center) by revolving it on spike stuck in a cup, and then spin it into cloth (Right). 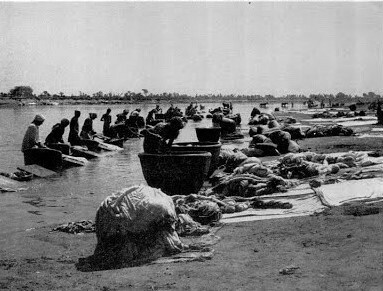 EUROPEANS' LAUNDRY is always washed by men at the Dhobe Ghat at Delhi, downstream from the ghat where the ashes of the dead are thrown into the Jumna River. 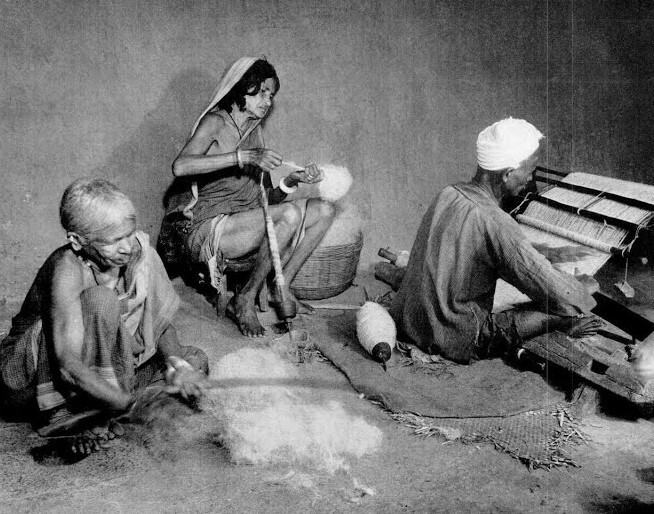 Men do the washing, though women may sometimes spread out the clothes. 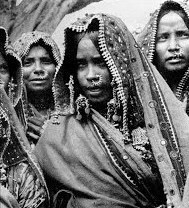 Indian women rarely come in contact with Europeans as servants. The big tubs are for starching and bluing. MANURE CAKES are the poor man's fuel of India. 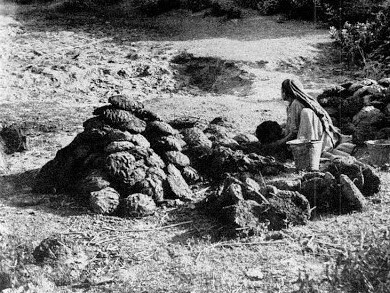 The dung of the animals is scraped up by women and children, formed into cakes and dried in the sun. Usually this is work for the Untouchables or "depressed classes," descendants of India's ancient Dravidians not taken into the caste system. Whole villages make a business of making and selling dung cakes. 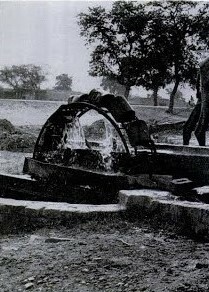 IRRIGATION of the dry Indian plain is done by a camel tamping in a circle, revolving a gear wheel (background) which in turn revolves bucket wheel (left). 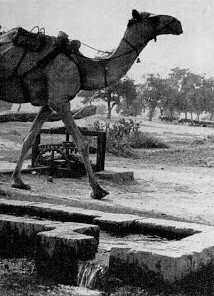 By building a vast network of canals and damns, British ended famines in India, raised total of irrigated land from 4,500,000 acres in 1879 to 32,000,000 today. Rich Indians who want to be honored now bequeath a well to their village. The bloody and gorgeous history of India has never yet been written and will not be written for some time. There has never been, in fact, a single India any more than there has ever been a single Europe. Countless peoples and cultures have fought here for their lives. New conquerors raged interminably out of the north and west, exterminated nations and cities, and themselves vanished into the boiling pool of this humanity. Few of their stories were written down, and when they were the next conquerors destroyed the record. Diggers in the west and north and east are today discovering under the ground the glories of totally forgotten civilizations that rivals Egypt and Sumeria 3,000 years ago. Above ground, some more recent magnificences remain. Two are shown on this page, one from the east and one from the north country of the Rajputs. There are thousands more, all different from one another. They are as often the work of slave peoples as of conquerors. All have a quality of strangeness, sometimes morbid but always incomprehensible to the West. THE WHEEL is one of the first crucial signs of civilization. 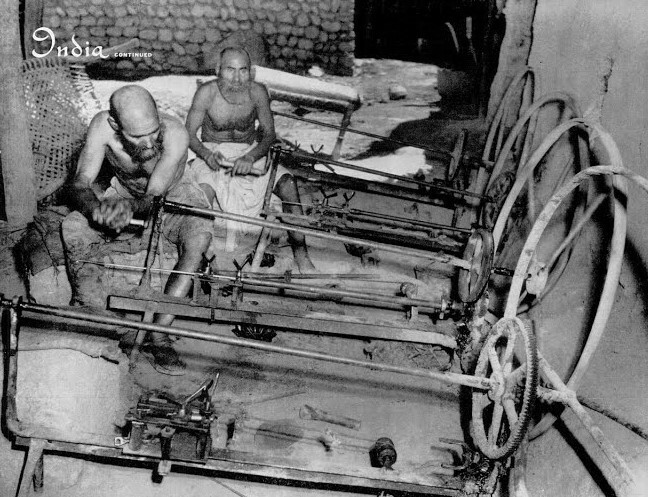 It first appeared in western India before 3000 B.C. 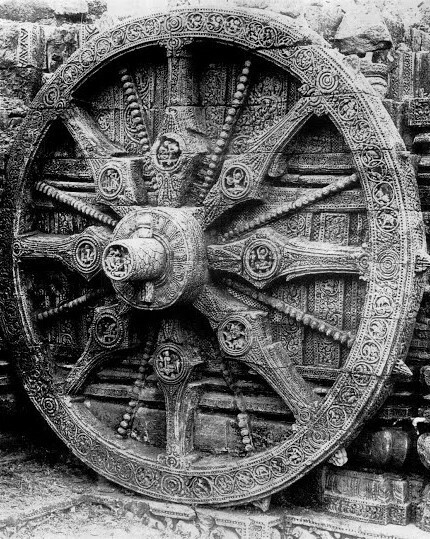 This carved stone wheel of the Brahman sun god's chariot on the Black Pagoda was built at Kanarak in Orissa 700 years ago, when a Moslem conqueror from Persia had overrun all the Indian plain. Nearby is the famous temple of Jaganath, or Juggernaut, at Puri. The 120-ft. tower of Kanarak has been called "the most richly ornamental building in the whole world." It is covered with antic human figures, horses, elephants and lions. ASTRONOMY got this imposing monument near Delhi in the north-central plain of the fighting Hindu Rajputs. The two perforated walled circles are to mark the rise and decline of the stars. 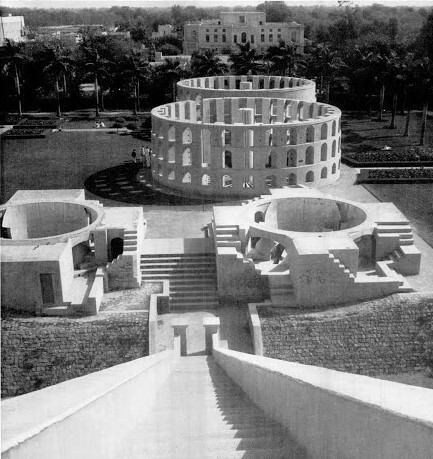 The photograph is taken from an immense sundial whose upright is 56 ft. high. All this was built by the great mathematician and astronomer, Maharaja Jai Singh of Jaipur, in about 1725. These Rajput Hindu princes were so afraid of their Moslem overlords that they covered their most glorious wall carvings with stucco, to avoid shaming Moslem art. 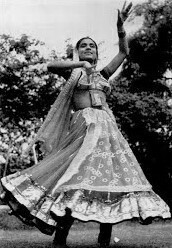 OFFICIAL'S DAUGHTER in Delhi is Maya Mani Chatterji, who goes through the artificial hand-posturing of the dance of the cowherds' daughters (Gopis) to seduce Lord Krishna, one of the Hindu gods. Maya has danced in London. This is very civilized, upper-class Indian dancing. 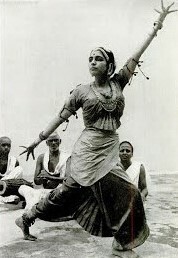 THEOSOPHIST'S WIFE is Rukmini Devi, 33, who is trying to revive the South India dance of Bharata-Natya, which had become d�class� because temple prostitutes used to dance it. Dance represents very spiritual emotions of the gods. She thinks Bharata-Natya will revive India. CAMP FOLLOWERS of the old invading armies were supposedly the ancestors of these Lombani women. They are laboring women who carry head loads of dirt in road construction, but they always wear these bone, ivory and shell bangles. 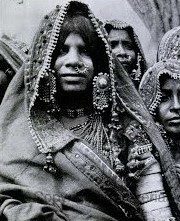 They are the gypsies of India. 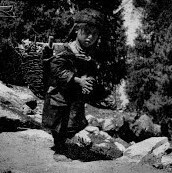 MOUNTAIN GIRL with eyes like a wood mouse carries firewood in the northern valley of Kashmir. As in most of India, this child began to work hard as soon as she could toddle. The next big event in her life will be to be married off in another few years. Note deodars in the background. 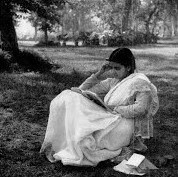 GIRL UNDERGRADUATE reads on the campus of the Sacred Heart Convent at Lahore in the central Punjab. She is upper-class and wears a native Indian sari. In all India, there are 31 arts colleges for women, eight training colleges and one medical college. But co-education is common. AN INDIAN ARMY fought and lost at Singapore. 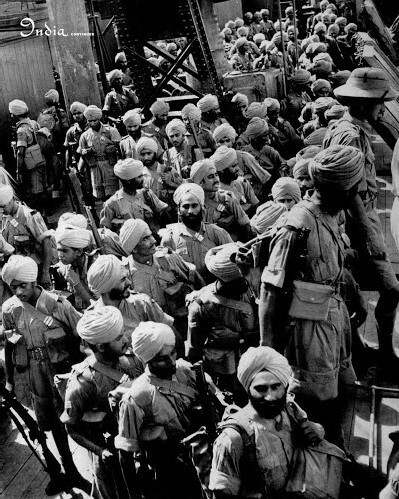 The bearded Sikhs shown here were among the approximately 50,000 Indian troops who participated in that campaign. Among the toughest fighters from India, they worship a sacred book and hold to five kakkars: uncut hair, short drawers, iron bangle, wooden comb and short sword. Every man carries the proud surname Singh, meaning lion. But Hindus are a minority in the Indian Army, its great backlog of fighting men being composed of Moslems from the Punjab and the Northwest Frontier Province. 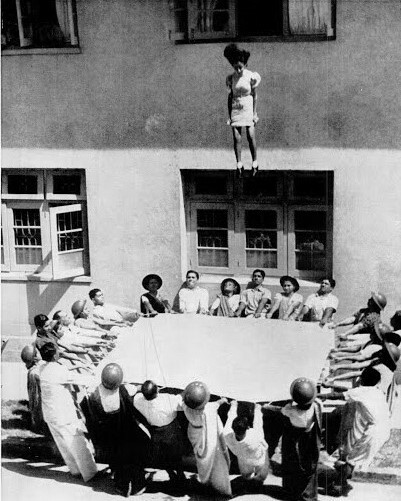 AIR-RAID PRECAUTIONS in Bombay, barely out of range of Jap Army bombers, induce this Indian girl to leap into a blanket held by fellow wardens, male and female. 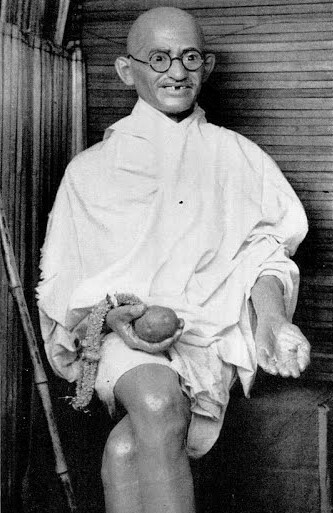 Probably no country has been caught so short by the threat of war as India, which had felt that any possible war cloud could only blow up from the west, whence all India's invasions have come. Instead, it now finds Japan pounding on the eastern gates of Burma. The aroused community spirit of the Indians has so far taken such forms as that above, which somehow suggests an Indian fakir's rope trick. Adapted from the March 16, 1942 issue of LIFE.